You must be pre-registered to gain access to this meeting. Venue: Ballroom of the North Academic Center on the CCNY Campus, New York, NY (Directions below). Enter via Convent Avenue at 138th Street (main entrance), to pick up your badge. You must be pre-registered to gain access to this meeting. Download Campus Map. 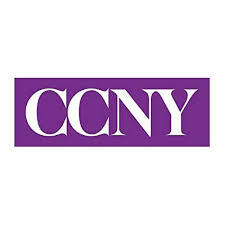 Subway: CCNY is accessible by five subway lines and two primary subway stations. • For the A, D (express, from 59th St, if coming from south) or B, C (local), get off at 145th St. station. Walk west on 145th St. one block to Convent Ave. Turn left (south) on Convent Ave. and walk to CCNY’s campus starting at 141st St. The North Academic Center (NAC) Ballroom is accessible from the Convent Avenue Entrance, just past Wingate Hall on right (on Convent between 140th and 135th Streets). • For 1 train, get off at 137th St. station. Walk north on Broadway one block to 138th St. Turn right (east) on 138th St. CCNY campus is at top of hill. Cross Amsterdam Ave. and enter campus, walking between the North Academic Building (NAC) (on right) and Townsend Harris and Wingate Halls (on left). To access NAC Ballroom, enter NAC on Convent Ave.
Metro North: Take the train to 125th Street stop. Take the northbound M100 or M101 bus to Amsterdam and 138th St. 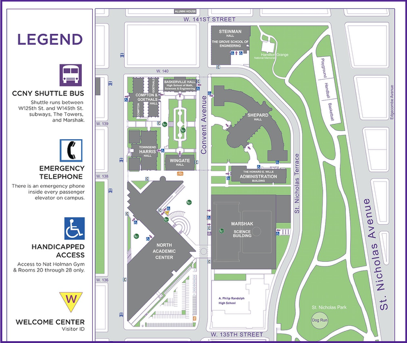 Enter CCNY campus by walking between the North Academic Building (NAC) (on right) and Townsend Harris and Wingate Halls (on left). To access NAC Ballroom, enter NAC on Convent Avenue. Limited parking spaces are available by reservation in advance. Please note that Convent Avenue from 135th St. to 140th St. is closed to vehicle traffic Monday-Friday, 8am - 6pm.